These striking Amaethyst Wash Bowl have sophisticated character for satisfying your embellishing needs. Messed up maroon color design is carved into the softly curved surface of this delicate marble. This piece is an elegant treasure you'll love having at home. Made from finest gemstones from around the world comes in 16 inches and 18 inches in different shapes such as round, oval and also made to order as per buyers designs. 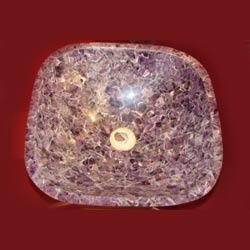 comes in wide variety of stones such as Tiger eye, Tiger iron, Lapis, Malachite, Jasper, Rose quartz, petrified wood, etc. Being a well-distinguished company in the market, we are into offering Drainboard Single Bowl Sink. 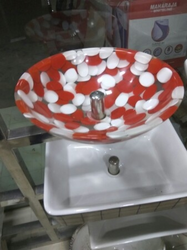 We are highly acknowledged organization Matching engaged in presenting a remarkable range of Bathroom Sink Bowl.